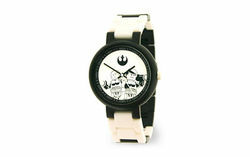 2851198 LEGO Star Wars Luke Skywalker & Han Solo Adult Watch is a Star Wars watch released in 2009. It is black and white and depicts Luke Skywalker and Han Solo inside. This is a description taken from LEGO.com. Please do not modify it. (visit this item's product page) Keep time with LEGO® Star Wars™! Build your own incredible LEGO Star Wars watch! Start with the white face, then add black and white links to build the watch band in any pattern you like. Includes an illustrated image of the LEGO Luke Skywalker™ and Han Solo™ minifigures on the face. Watch face features image of LEGO Luke Skywalker and Han Solo minifigures! Facts about "2851198 LEGO Star Wars Luke Skywalker & Han Solo Adult Watch"
Keep time with LEGO® Star Wars™! This page was last edited on 9 January 2016, at 06:41.